allentown vegan | Save the Kales! For a list of even MORE vendors, take a peek at our 2014 Vegan Musikfest post, with a walk-through of the entire fest. Most vendors are still here in 2016! And our active private Facebook group: Team Save the Kales! Hello, lover. Unofficially touted as “The Best Food of Musikfest 2016” by vegans and non-vegans alike, if you only get one stop, make it Ticas Tacos. This is fresh, thoughtful food with a ton of flavor. The standard vegan taco comes with: black beans, hominy, sweet plantain, pickled red onion, pineapple pico, and chipotle vinaigrette. Order one or ten, sold individually at 4 Tickets ($4) each. Order Tip: Can also be made into a large BURRITO. Or ask for vegan “loaded fries”. Marbled rye toasted in coconut oil, hugging spicy small-batch kimchi, tempeh, melted vegan cheese and a little vegenaise for added creaminess. Served warm, sloppy, and delicious. This is an average size sandwich (not HUMONGOUS like much of the Musikfest food), but it’s delightfully messy and most importantly, quite tasty. 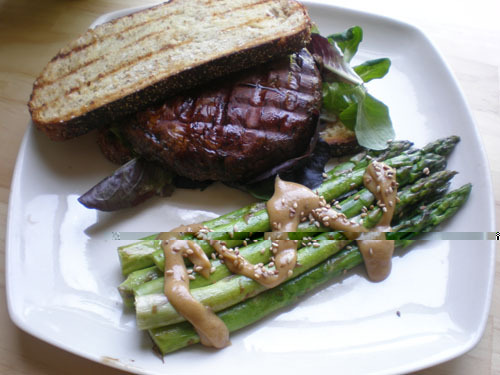 A great meal that won’t leave you so full you can’t eat something else later. More snacks > less snacks, yeah? Order Tip: Ask for it made vegan! They have dairy cheese, too, so be specific. This is a yummy slice of vegan cheesecake on a stick, dipped in dark chocolate, with options for added toppings like sprinkles or peanuts. Cheesecake is made by the talented and lovely Sweet Doe Bakery, so obvs. it’s delicious! This stand has a ton of vegan options, though, so check out the gourmet popsicles if you’re not feelin’ creamy chocolate on a piece of wood. Order Tip: You can order with or without chocolate and extra topics are $1. Leave it to a bunch of folks in Pennsylvania to be ENTHRALLED with corn. Eating this (and anticipating it for a year) is a ‘Fest rite of passage. 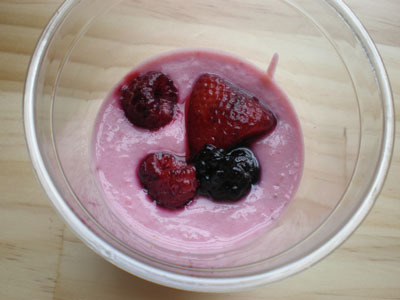 This typically smothered-in-dairy snack is easily made vegan if you ask for it. Go see what all the fuss is about, and prepare to see more social media comments on your photos of CORN than photos of your children. Order tip: No butter, no cheese. The other spice is vegan! Carby thick noodles and veggies all stir fried together in a massive wok, with lots of sriracha on the condiment bar. Add as much as you want (all of it?). These are easily accessible no matter where you are inside the ‘Fest. They travel well if you need to use up food tickets, as the cardboard container folds up and closes for a BONUS SNACK later. Order tip: Veggie with no meat. I don’t have photos, and anything with a “*” means it should be vegan but haven’t asked them personally, so just check in. Let us know if you find out, mmkay? Facebook group: Team Save the Kales! Use #veganmusikfest on instagram and twitter! More updates will be made as Musikfest continues, so check back! Thanks to the Artsquest Marketing department for being so darn nice, and helping me scope out the vendor list. I hope you get to treat yourselves to some tacos. 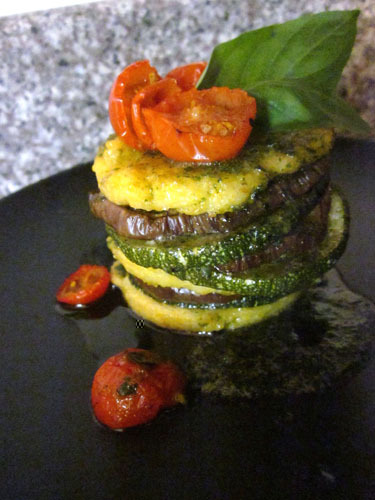 VIDEO: Veggie Stacks inspired by the Bethlehem Vegfest Posters! 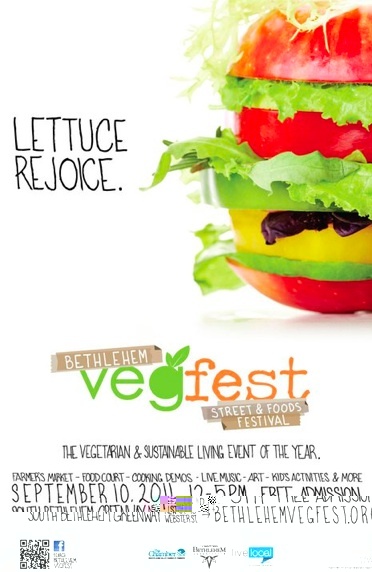 Bethlehem Vegfest is less than a month away (holy moly! ), and I’ve been looking at the poster design by Christian Weber Creatives and got inspired to make this dish. I also hope you’ll give a round of applause, once again, to Matt and Sarah of Lehigh Valley Mirror for turning this video into a Save the Kales web cooking show – which will become a monthly feature! This is the first one and I am so excited to get better, share more recipes and little tips called “Food For Thought” (an homage to Colleen-Patrick Goudreau’s amazing podcasts, but also a fun play on words). This is some of great poster art for Bethlehem Vegfest, six designs in total, and you can find all the designs on the facebook event page! WATCH THIS VIDEO, OH MY GOSH! *This recipe makes enough for 2-3 stacks, but you can make a hundred more depending on how many veggies you use and how big they are. Heat oven to 350 degrees. Spray a cookie sheet with nonstick spray, and lay out cut zucchini and eggplant. Brush lightly with olive oil and season with a little sea salt and pepper. Put in the oven for about 25 minutes, until veggies are cooked and tender. When you have about 10 minutes of cooking time left, put the cherry tomatoes in the oven (use the same cookie sheet if you have room). Heat olive oil in a pan, enough to coat the bottom. Add the polenta slices and cook for 5-8 minutes on each side. One side is done when it’s golden in color. Move to a plate covered in paper towels to absorb some of the oil. In a small saucepan, add about 1/4 cup olive oil and heat on medium high. Add the grated garlic until it starts to just brown, but not burn. (Make sure the heat is not too high.) Allow to simmer for about 5 minutes becoming very fragrant. Remove from heat. Allow oil to cool a bit, or just be careful not to burn yourself for this next step! Add garlic oil to a blender or food processor with 1/2 cup fresh basil, and blend on high until oil becomes green. Start stacking! I used polenta on the bottom since it’s a little sturdier, but go in any order. Top with a drizzle of the garlic and basil oil, some of the roasted tomatoes, and a leaf or two of fresh basil. PRETTY! Go check out Lehigh Valley Mirror, check back for more Save the Kales! 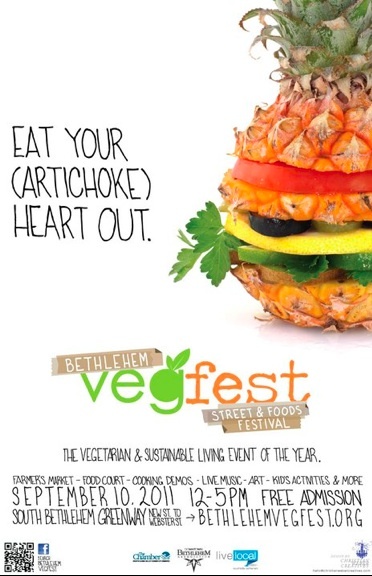 videos, and we’ll see you at Bethlehem Vegfest! I WATCHED OPRAH GO VEGAN: Now What!? This afternoon The Oprah Show devoted an entire episode to veganism. Her staff was issued a 1-week challenge to go vegan at work and at home. Reporter Lisa Ling went inside a slaughterhouse to show everyone where meat comes from. 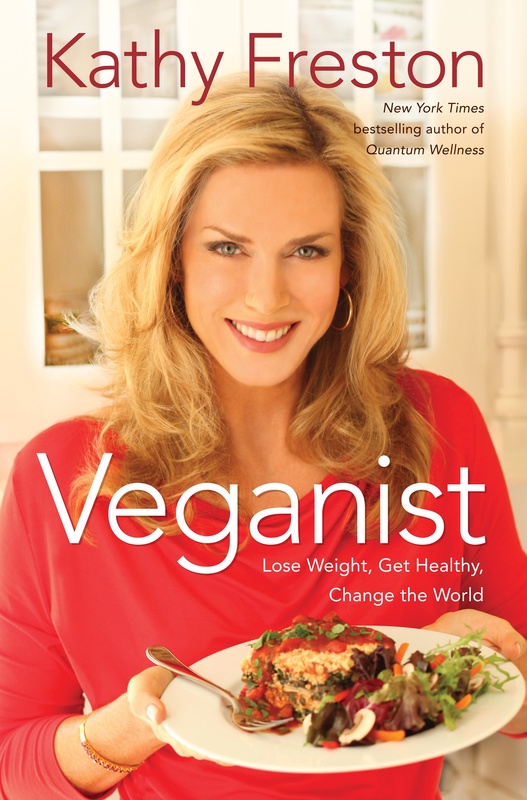 Author Kathy Freston (one of my all-time favorite vegan authors – she ties in the spiritual aspect of eating a plant-based diet which I love) was on the show promoting her new book Veganist: Lose Weight, Get Healthy and Change the World – and helping everyone at Harpo get adjusted. You don’t need to commit to being vegetarian or vegan 100% of the time to reap the benefits and still help yourself, animals and the earth. But every time you make a plant-based diet decision, you benefit ALL of those things! 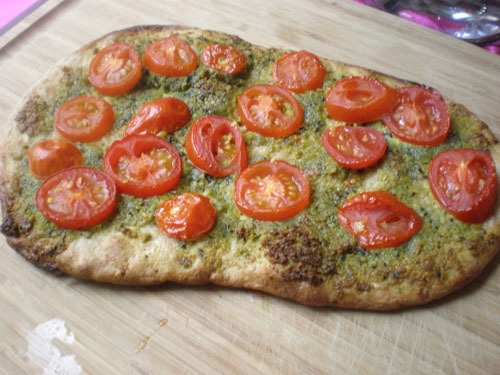 Pizza tart with broccoli almond-walnut pesto and fresh tomatoes on whole wheat crust. If you saw this show and are thinking of ways to “lean into” vegan eating, or just go “vegan-ish” a few times a week and don’t know how to start – let me help you! take you food shopping! I’ve been on a budget my whole life, and know the importance of saving money and making healthy meals that taste good on a limited amount of money. Supermarkets can be overwhelming and hard to navigate. I can work with you by going to your grocery store (it’s okay that we don’t have Whole Foods!) and showing you how to shop the store, as well as introduce some new local stores (like ethnic markets and farmers markets). help you with the basics of cooking. This includes everything from getting the right kitchen tools to basic pantry staples. The right tools will make cooking EASY and FAST, and you don’t need to spend hundreds of dollars on fancy appliances. Learning basic cooking methods like how to roast veggies and make tofu delicious will help you infinitely! By having some herbs and spices on hand and knowing how to blend them, you can make very inexpensive, low-fat meals any time. help you learn about plant-based diets and nutrition. If you want to ask the tiresome “Where do you get your protien?”, I’d be happy to retort with “Where do you get your fiber, B-vitamins, folic acid, magnesium, potassium, calcium, iron…. shall I go on?” You can get ALL THE PROTEIN YOU NEED from a plant-based diet. Did you know, ounce for ounce, broccoli has TWICE AS MUCH protein as steak? It’s true! There are so many wacky food myths – we can set the record straight! 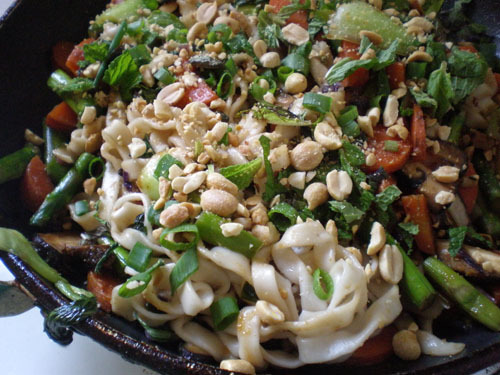 Spicy veggie stir fry with wide rice noodles and peanuts. I believe in welcoming, informative and fun education and would love to help you incorporate vegan cooking into your life in a way that feels right for you. You will save money, increase your health and help the earth and animals as well as yourself. *Here is the disclaimer where I tell you that veganism is NOT only about food, but a lifestyle and for many, a belief system that shines through in day-to-day life, decision making, etc… There are MANY wonderful resources and people educated on helping you learn more about those aspects. I’m happy to help with the food since I am most confident in my abilities on that topic. If you’d like help finding more information, me or other readers would love to assist in any way we can! Just ask!